This Etley point represents one of the finest examples ever found. It was discovered by Illinois State Museum archaeologist in an Archaic cemetery on the Airport site on the Sangamon River near Springfield, Illinois. Wadlow, Sedalia and Nebo Hill points were also found at the Airport site. 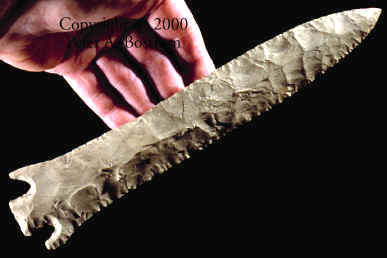 This point was made from Burlington chert and measures 9 1/4 inches long, 11/16 inch wide and 7/16 inch thick. Etley points were named by Edward G. Scully for the "Oettle" farm but this name was later changed by Dr. P.F. Titterington to "Etley" (Perino 1985:127). Etley points were made during the Titterington phase. This phase was an archaeological manifestation centered in the St. Louis area which is well known for its buried caches of large blades. This phase dates approximately 3,000 to 1,000 B.C. (Cook 1976:65). The age for Etley points dates approximately 2,000 to 1,000 B.C.